With the growing understanding of traditional Chinese medicine in the West, its undeniable efficacy is beginning to catch the attention of people all over the world. In order to provide Western readers with a clearer understanding of this exotic ancient flower of traditional Chinese medicine, this book presents over twenty clinical cases of diseases which can be effectively treated through the use of massage therapy. It also introduces sixty-one massage techniques for relief from fatigue in different body parts, for keeping fit and for adjuvant treatment. All of this is accompanied by detailed illustrations, which make the book invaluable and convenient for both learners and practitioners of Chinese massage therapy. Pan Chang is director of the Rehabilitation Department of the Traditional Chinese Medicine Hospital of Shuangliu County, a key special hospital of Sichuan Province. As an associate doctor and specialist in traditional Chinese medicine, Pan was awarded the title of Famous Doctor of Traditional Chin Medicine in Shuangliu County. Pan has been engaged in the study and practice of traditional Chinese medicine of over thirty years and now is an expert in its techniques in Sichuan Province, where he is a member of the Sichuan Expert Committee of Rehabilitating Medicine and Physical Therapy, member of the Sub health Expert Committee of the Traditional Chinese Medicine Society of Sichuan province, as well as director of the Chengdu Acupuncture Society. 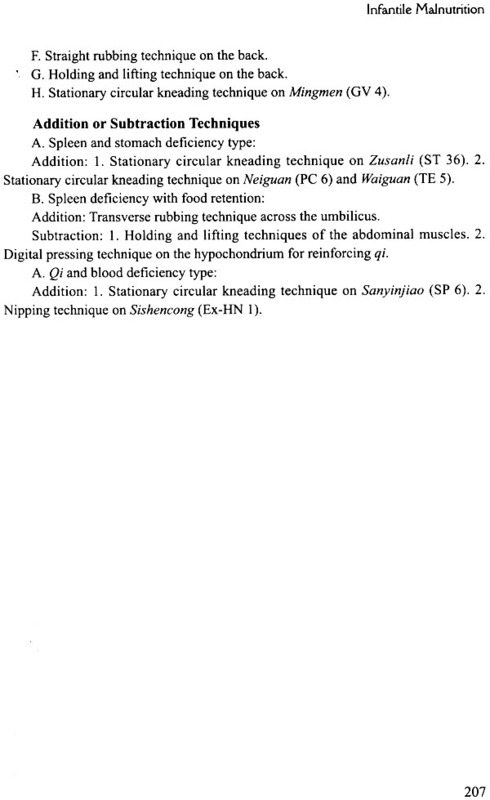 Pan has published more than thirty medical papers and five books (in Chinese and English). He obtained three patents for inventions in traditional Chinese herbal medicine and two patents in medical applicability and won a Prize for Progress in Science and Technology by accomplishing a research program at the city level. Pan specializes in Chinese herbal medicine, acupuncture, and massage to treat post-stroke paralysis, facial paralysis, cervical vertebra disease, lumbar Intervertebral disk protrusion, and chronic pharyngitis with remarkable effects. Chinese massage originated from the cuneiform stone remedy in the Neolithic Age. It was called Anmo (or Anqiao, or Daoyin) before the Ming Dynasty (1368-1644) because of its simple techniques and nonsystematic theory. After the Ming Dynasty, with the development of traditional Chinese medicine (TCM), Chinese massage was finally formed. In order to popularize, develop and make best use of traditional Chinese medicine for human health, it is of great significance to publish this book in English. The book is terse and concise. 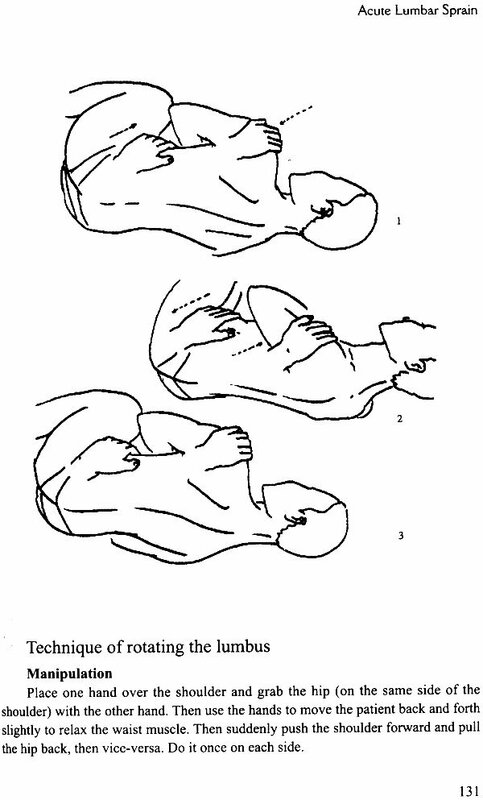 The massage techniques adopted in the treatment are demonstrated with simple diagrams instead of words, so readers can learn it with ease. The diagrams of massage techniques are separately used for each indication and independently laid out for other indications; thus, readers can get twice the result with half the effort. We discuss the principles, symptoms and effects of treatment in simple and clear language to help readers grasp Chinese massage in a short time. 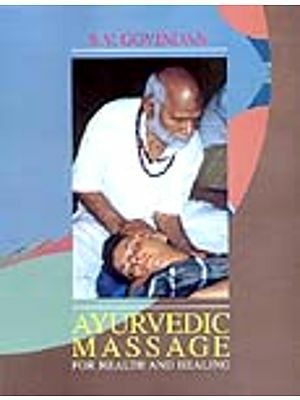 The book is characteristic of a combination of TCM theory and clinical practice of massage techniques. It is written to be easy to learn. In this case, it is not only good for readers to quickly understand the manipulation of massage, treatment principles and the indications, but also helpful for readers to put what they have learned into practice. 1. Accuracy of the points. In the book, the location of each point is precisely elaborated and indicated. If readers are still not clear about the anatomic positions of the points, they should first consult the sketch figures of points and proportional measurements at the beginning of the book or other professional books concerning acupoints, so as to achieve a satisfactory treatment effect. Generally speaking, if the book says "Place a finger on one particular point," this will require the massager to accurately massage on that point; if the book says "Place four fingers (or one palm or sole) on (or push to) some point," this will require the massager's fingers (or palm or sole) to be placed at (or pushed to) the same height of this point or the region of the point. 2. Measurement of the points. The cun mentioned in the book refers to the unit adopted by proportional measurement and finger measurement. Details can be seen in the figures of Bone-Length Measurement and Commonly Used Points in the appendix. 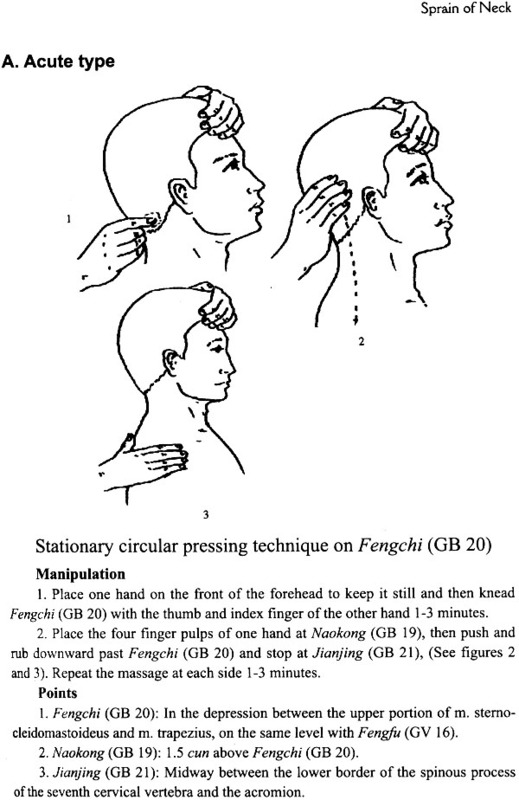 Besides, in order to provide more convenience in reading the book, the location of the same point is explained differently in the diagrams of different massage techniques. 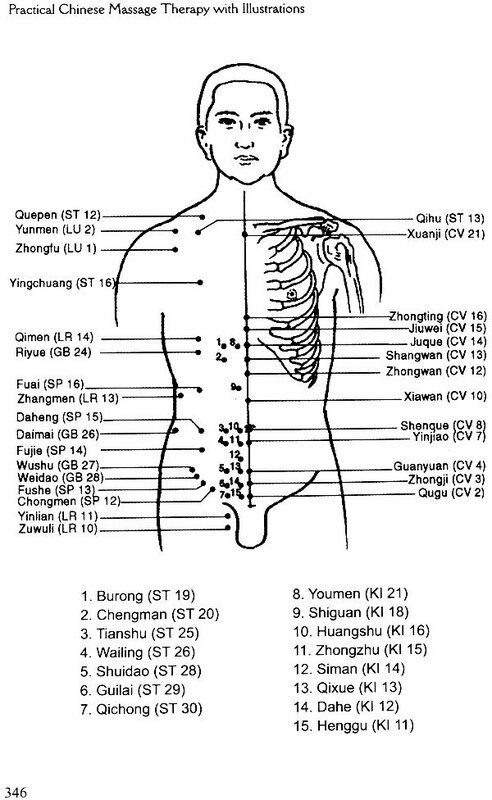 For example, in one manipulation diagram, which shows the massage of Shenque (CV 8) and Guanyuan (CV 4) points, it is written that the location of Shenque (CV 8) is at the center of the umbilicus and the location of Guanyuan (CV 4) is 3 cun directly below Shenque (CV 8). But in another manipulation diagram showing massage of Qugu (CV 2) and Guanyuan (CV 4) points, it is said that the location of Qugu (CV 2) is at the middle point of the upper margin of the pubic bone and the location of Guanyuan (CV 4) now is 2 cun above Qugu (CV 2). In this way, readers will get a clear idea about each method just by taking a glance at the corresponding diagram of points. 3. Duration and frequency of massage. The quintessence of traditional Chinese medicine is the conception of the organism as a whole as well as diagnosis and treatment based on an overall analysis of symptoms and signs, the cause, nature and location of the symptom and the patient's physical condition. Different patients have different physical conditions, pathological statuses and prognoses, so the same massage manipulation on different patients requires alternation in duration and frequency. One should appropriately prolong or reduce the manipulating time to get a satisfactory treatment effect. 4. Degrees of strength and dexterity of massage. Only with proper massage strength can the satisfactory treatment effect be achieved. So, the intensity of strength exerted in the treatment is not proportional to the treatment effect. Sometimes it is quite the opposite. Moreover, dexterity is even more important. To master the skill of massage, one needs not only to study hard and practice more, but also to learn qigong to increase one's internal power, so that one can be dexterous, not clumsy in the massage treatment. On the other hand, if a reader wants to be a qualified massage therapist, he or she should not only learn the theory of traditional Chinese medicine, but also know some theory of Western medicine, such as pathology, physiology and anatomy. Thus, he or she will know which pattern of a disease can be treated by massage. 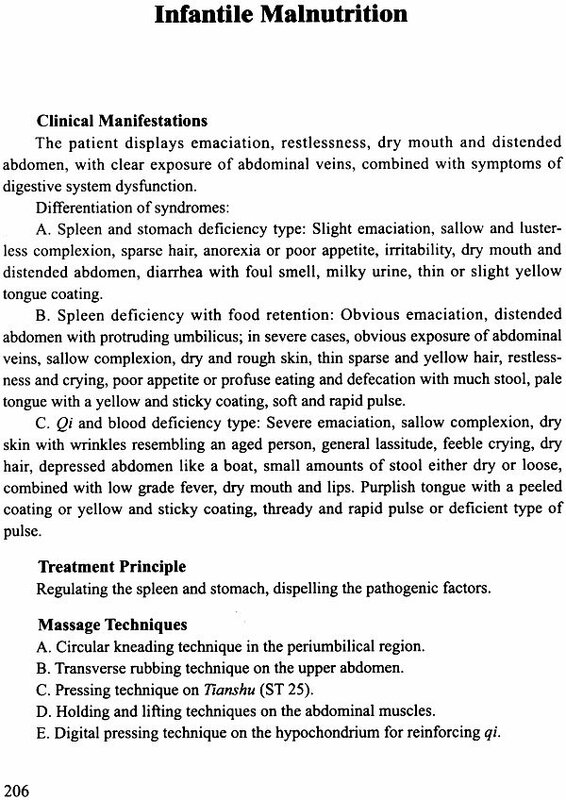 If the same disease shows different clinical symptoms, it may not be treated by massage. 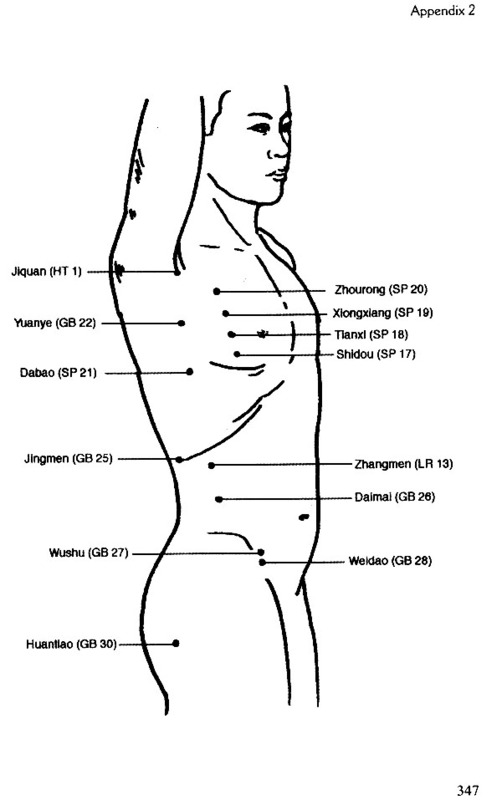 He or she also will know what the massage effects are and whether the massage regions and point locations are correct or not and so on. I would like to thank my teachers Prof. Luo Jinghong and Prof. Luo Zhongda, who warmly supported and encouraged me to write this book, and I also would like to express my gratitude to all my family members, who have shown deep concern for me and offered hearty assistance in my research of traditional Chinese medicine for a long time. I welcome colleagues, at home and abroad, to comment on the text. The comments will be beneficial for future revisions of this book so that it will better serve as a book for popularizing traditional Chinese medicine and meeting the demands of popularization and development of traditional Chinese medicine.